The Emotional Maturity domain of the Early Development Instrument (EDI)** includes the ability to think before acting, a balance between being too fearful and too impulsive, an ability to deal with feelings at the age-appropriate level, and empathetic response to other people’s feelings. 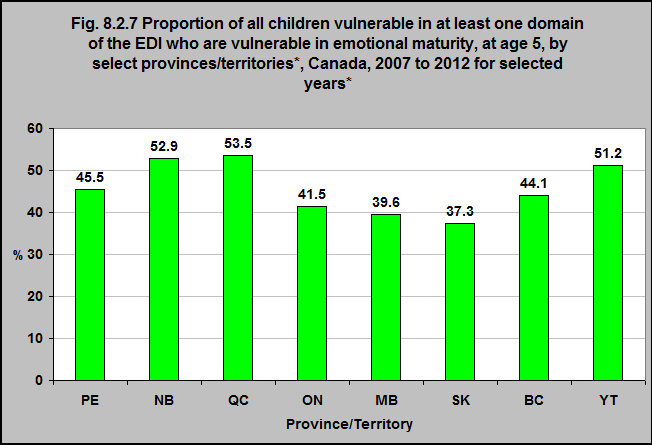 More than half of all children in Québec and New Brunswick (53.5% and 52.9% respectively) who are vulnerable in at least one area of the EDI are vulnerable in emotional maturity. 37.3% of the children in Saskatchewan who are vulnerable in at least one area of the EDI are vulnerable in emotional maturity.